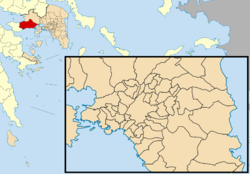 Megara (/ˈmɛɡərə/; Greek: Μέγαρα, pronounced [ˈmeɣara]) is a historic town and a municipality in West Attica, Greece. It lies in the northern section of the Isthmus of Corinth opposite the island of Salamis, which belonged to Megara in archaic times, before being taken by Athens. Megara was one of the four districts of Attica, embodied in the four mythic sons of King Pandion II, of whom Nisos was the ruler of Megara. Megara was also a trade port, its people using their ships and wealth as a way to gain leverage on armies of neighboring poleis. Megara specialized in the exportation of wool and other animal products including livestock such as horses. It possessed two harbors, Pegae, to the west on the Corinthian Gulf and Nisaea, to the east on the Saronic Gulf of the Aegean Sea. 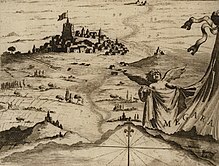 In historical times, Megara was an early dependency of Corinth, in which capacity colonists from Megara founded Megara Hyblaea, a small polis north of Syracuse in Sicily. Megara then fought a war of independence with Corinth, and afterwards founded Chalcedon in 685 BC, as well as Byzantium (c. 667 BC). Megara is known to have early ties with Miletos, in the region of Caria in Asia Minor. According to some scholars, they had built up a "colonisation alliance". In the 7th/6th century BCE these two cities acted in concordance with each other. In the late 7th century BC Theagenes established himself as tyrant of Megara by slaughtering the cattle of the rich to win over the poor. During the second Persian invasion of Greece (480–479 BC) Megara fought alongside the Spartans and Athenians at crucial battles such as Salamis and Plataea. 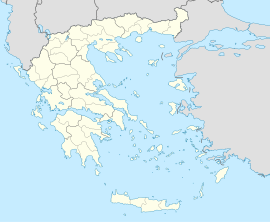 Megara defected from the Spartan-dominated Peloponnesian League (c. 460 BC) to the Delian league due to border disputes with its neighbour Corinth and it became one of the causes of the First Peloponnesian War (460 – c. 445 BC). By the terms of the Thirty Years' Peace of 446–445 BC Megara was returned to the Peloponnesian League after successfully revolting from the Delian league. In the (second) Peloponnesian War (c. 431 – 404 BC), Megara was an ally of Sparta. The Megarian decree is considered to be one of several contributing "causes" of the Peloponnesian War. Athens issued the Megarian decree with the aim of choking out the Megarian economy. The decree banned Megarian merchants from territory controlled by Athens. The Athenians claimed that they were responding to the Megarians' desecration of the Hiera Orgas, a sacred precinct in the border region between the two states. Arguably the most famous citizen of Megara in antiquity was Byzas, the legendary founder of Byzantium in the 7th century BC. The 6th century BC poet Theognis also came from Megara. In the early 4th century BC, Euclid of Megara founded the Megarian school of philosophy which flourished for about a century, and which became famous for the use of logic and dialectic. During the Celtic invasion in 279 BC, Megara sent a force of 400 peltasts to Thermopylae. During the Chremonidean War, in 266 BC, the Megarians were besieged by the Macedonian king Antigonus Gonatas and managed to defeat his elephants employing burning pigs. Despite this success, the Megarians had to submit to the Macedonians. 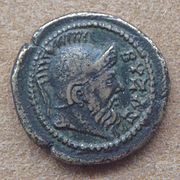 In 243 BC, exhorted by Aratus of Sicyon, Megara expelled its Macedonian garrison and joined the Achaean League, but when the Achaeans lost control of the Isthmus in 223 BC the Megarians left them and joined the Boeotian League. Not more than thirty years later, however, the Megarians grew tired of the Boeotian decline and returned their allegiance to Achaea. The Achaean strategos Philopoemen fought off the Boeotian intervention force and secured Megara's return, either in 203 or in 193 BC. The Megarians were proverbial for their generosity in building and endowing temples. Saint Jerome reports "There is a common saying about the Megarians [...:] 'They build as if they are to live forever; they live as if they are to die tomorrow.'" Megara seems to have experienced democracy on two occasions. The first was between 427, when there was a democratic uprising, and 424, when a narrow oligarchy was installed (Thuc. 3.68.3; 4.66-8, 73-4). The second was in the 370s, when we hear that the people of Megara expelled some anti-democratic conspirators (Diod. 15.40.4). By the 350s, though, Isocrates is referring to Megara in terms that suggests that it was an oligarchy again (Isoc. 8.117-19). One of the first actions of the new oligarchy in 424 was to compel the people to vote openly, which suggests that the democracy had made use of the secret ballot. Megarian democracy also made use of ostracism. Other key institutions of the democracy included a popular Assembly and Council, and a board of five (or six) generals. The municipality of Megara was formed at the 2011 local government reform by the merger of two former municipalities, Megara and Nea Peramos, which became municipal units. The municipality has an area of 330.11 km2, the municipal unit 322.21 km2. ^ Sarah B. Pomeroy, Stanley M. Burstein, Walter Donlan and Jennifer Tolbert Roberts, Ancient Greece: A Political, Social, and Cultural History (Oxford: Oxford University Press, 1999). ^ E. Robinson, Democracy Beyond Athens, Cambridge 2011, 46-47. ^ "Kallikratis law" (PDF) (in Greek). Greece Ministry of Interior. 11 August 2010. pp. 17367–17454. Retrieved 6 November 2018. ^ "Population & housing census 2001 (incl. area and average elevation)" (PDF) (in Greek). National Statistical Service of Greece. 18 March 2011. p. 437. ISSN 1106-5761. Retrieved 6 November 2018. ^ Oost, Stewart Irvin (July 1973). "The Megara of Theagenes and Theognis". Classical Philology. The University of Chicago Press. 68 (3): 186–196. doi:10.1086/365976. JSTOR 267749. ^ Ravindran, Renuka (April 2007). "The Life of Euclid" (PDF). Resonance. Indian Academy of Sciences: 3. Retrieved 6 November 2018. ^ Platts, John (1825). A Universal Biography: 1st series. From the creation to the birth of Christ. Sherwood, Jones, and Company. p. 479. ^ Preus, Anthony (12 February 2015). Historical Dictionary of Ancient Greek Philosophy. Rowman & Littlefield. p. 381. ISBN 9781442246393. Herbermann, Charles, ed. (1913). "Megara" . Catholic Encyclopedia. New York: Robert Appleton Company. Chisholm, Hugh, ed. (1911). "Megara" . Encyclopædia Britannica. 18 (11th ed.). Cambridge University Press. p. 76.